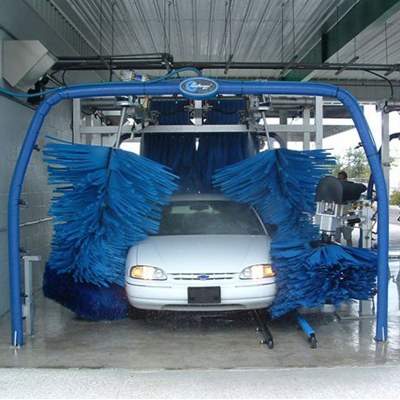 Belanger's Insta-Kleen™ is a high volume drive through fleet wash system that is engineered for continuous reliable performance. Whether you offer vehicles for rent, lease, or sale, the insta-KLEEN's fast, superior wash results will help keep your vehicles looking their best. Built for heavy-duty use, ultimate cleaning speed, and ease of installation, the insta-KLEEN™ delivers maximum performance with every wash. We use only the highest grade materials, like aircraft-grade aluminum, high-density plastics, and state-of-the-art electronics to ensure that your wash is up and running when you need it. The insta-KLEEN™ system can easily take the punishment of washing large volume vehicle fleets with consistent reliable results each and every time. As with all Belanger wash systems, the Insta-Kleen™ is designed around a very flexible wash configuration model that enables you, the customer, to build the wash solution that best meets your needs. In fact, it is easy to add a conveyor, additional wash components, dryers, or chemical applicators to further expand your options. Then turn your investment into an additional revenue center and gain the upper hand over your competition.